Do you know Your Marketing Agency? Is your business not getting the results you wanted? Or are you wondering what’s going to put you above and beyond your competitor down the street? Sometimes questions like these can be answered simply by hiring the right people. If you want results that you can see, 219 Group is who you’re looking for. Located in the center of downtown Fayetteville, NC with many clients spread throughout the city, you could easily call us the heartbeat of the city. 219 group specializes in advertising, marketing, graphic design, logo design, public relations, social media marketing, and more. If you’re looking for an agency that can handle it all without taking up a lot for your time, 219 group is your place. Whether you need to revamp your logo or completely shake up your style in order to attract new customers, 219 Group has got you covered. When we take on a new client we make it our mission to be as knowledgeable about you and your services as possible. In some cases, this means going to great lengths to take part in your services as a consumer, seeing first-hand how your product works and how we can better market you to your target market. Our ultimate goal is for you to succeed and get the results you want to see in your business or organization. Working with 219 Group is a one of a kind experience as you will soon find out during your first meeting with us. Our modern working environment has proven time and time again to yield results that are unlike other marketing and advertising agencies. The 219 group culture allows for ideas to continue to flow which means your business will always remain fresh and current. Digital Marketing Strategies take place online but don’t think this limits your options. Your digital marketing plan can include mobile phones (texting and in-app advertising), display advertising, search engine marketing and many other digital mediums. The key is to promote as much as possible, a brand, products or services, using various forms of digital media and of course most importantly a good return on investment (ROI). After all, cash is king. Why is a good digital marketing plan important? People have access not only to what your company wants them to know about your products and services but because of the web and other digital mediums they can find out what other people are saying about your company. They will see reviews, critiques, articles and so much more. People want brands they can trust and personalized communications. A good digital marketing plan needs to be custom tailored to your company, to your brand and be able to reach the right consumers. People are now looking to shop, buy, look at reviews, get their news, entertainment, answers to their problems, online more than ever and this will only increase in time. Whereas before people would look for answers globally, now people want more personal communications, they are looking online for more local solutions. If you have a small local business you don’t want to advertise your brand, products, services or special offers around the globe. With an effective digital marketing plan, you should be able to promote your brand to local consumers. If you are located in Fayetteville, NC or Raleigh, NC – your digital marketing campaign can target those specific locations or both locations if you are looking to grow! You also want to be able to measure the effectiveness of your digital marketing campaigns, what’s working, what adjustments need to be made, what consumers need to be reached out to. The need for businesses to invest time and money in a good marketing plan is growing more by the day! A business cannot grow without a good digital marketing plan. Your Digital Marketing Plan should include developing creatively intriguing ads. Adding creativity when developing your digital ads increases its effectiveness. It’s been proven time and time again that a good Digital Ad is cost effective and brings about a better ROI. Your digital ads should compliment your non-digital advertising and make them more effective as well. Digital Marketing Plans should include a remarketing strategy. Remarketing is a way to connect ads to consumers that have already visited your website. How your company uses remarketing depends on how your business makes contact with your customers. Is your company a business to business (B2B) company? Are you an online retailer? Is your business a brick and mortar shop? A remarketing plan should be custom tailored to your business. When developing an overall Digital Marketing Plan, it needs to use a wide range of digital mediums, it must complement your other marketing campaigns and should make your non-digital advertising more effective. A good plan will have creative digital ads which will improve the ads effectiveness and bring about a good ROI. There are so many options, don’t limit yourself and remember a good plan must be tailored to your business! 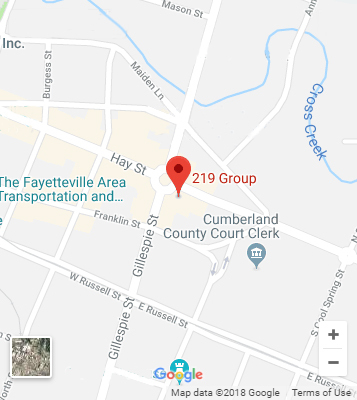 With a full-service marketing and advertising agency located in downtown Fayetteville, NC, 219 Group is the complete package when it comes to developing your company. Made up of a team of award-winning, and creative minds – the ideas never stop flowing over here at 219, which means your business will never stop growing when you chose to work with us! Since 219 is a full-service agency. We are your one-stop-shop for all of your public relations, marketing, and advertising needs. Specializing in brand development, media services, digital marketing, public relations, lead generation, graphic design, analytics and more! We are sure to have everything you need to give your organization the extra boost it needs to be successful. Every successful business started with building a relationship with their community, luckily for you, relationships are our specialty, especially when it comes to reaching out to your target markets. We handle all the little details so that you can focus on what matters most, your customers. Let us share your vision for your business, and help you build your empire with collaborative ideas and goals. Our public relations team is skilled at maintaining your public image with tools such as press releases that display your organization in the most engaging, and dynamic light, all while making sure that your information gets distributed to the right people that are sure to be interested in you! Once your name is out then we move on to manufacturing your brand’s loyalty by building your reputation and turning your consumers into lifelong brand ambassadors. You’ve most likely heard of Search Engine Optimization (SEO) or looked into it. What exactly is SEO? The short and simple version: Search Engine Optimization is optimizing a website or blog so that it improves in search engine rankings. You want your business to be one of the top search results. – Your competitors are investing in it or might be soon. If your competitors aren’t investing in SEO then now would be a great opportunity to get ahead of them. – Search Engine Optimization is cost effective, it shouldn’t even be considered a cost to your business but an important investment. – Understand the potential SEO can bring to a business and you’ll know why it should be an important part of a marketing strategy and a necessary investment. – Search engines are grabbing more market share and a majority of people now check for products, services, reviews or business websites online before making a purchase. This will surely only increase in time. When someone does a search online, do you want them to be able to locate your business? Do you want your business to be at the top of the searches? Without Search Engine Optimization, people will have a difficult time finding your business or firm and will instead find your competitors. With a dramatic increase in mobile usage and more effective Search Engine Optimization techniques, we are now experiencing a rise in local search optimization. Once internet users wanted global information when they search for solutions to their problems or answers to their questions. Now increasingly people want more personal results and they want them in the area that they live. When people search for a business or service that they need, they are looking for the top results that show up near them. Search Engine Optimization is a way to optimize your website so search engines will increase it in rankings making it one of the top search results, ultimately increasing traffic to the website. Local SEO is a great investment for small business and a way to increase traffic to their websites when local people search for businesses and services. It should be a part of your marketing strategy and is an important investment that allows small businesses to stay ahead of their competitors.